Portuguese is the official language of the Institution. It is used in all the official communications and as a working language. At the same time, linguistic diversity is highly encouraged, with English as the main foreign language. Both the ESTF and the ESEF offer to our Erasmus+ incoming students’ classes and personal tutoring in English in order to assess the quality and effectiveness of delivering induction and its personal support/tutorial arrangements. Students from Spain or Spanish language speakers are not required to know English. If you are interested in coming to the Escola Superior de Educação (ESEF) or to the Escola Superior de Tecnologias (ESTF) for an Erasmus+ period of studies, your home university must have an active Erasmus+ inter-institutional agreement with the corresponding academic department in ESEF or ESTF and have nominated you for a place in good time for the application deadline. Once we have received your nomination from your Erasmus Coordinator, you will be invited to start your application. Important: Only forms downloaded from our website will be accepted. The forms must be completed electronically and sent scanned in PDF format. Handwritten forms and the pictures of the documents taken by your mobile phone's cameras will be rejected. The relevant Department considers the application and we will contact you to let you know whether your application has been accepted. The Letter of Acceptance is sent if requested. Please read the Erasmus+ Student Guide carefully. All foreign exchange students coming from non-EU countries are required to hold a study visa obtained at the Portuguese Embassy or Consulate of their home country, which is valid for one year. Students coming from any EU member state are allowed in the country upon the presentation of a valid ID card or passport and their entry in Portugal is not subject to any control. However, the law states that for stays longer than 3 months these students (coming from any EU member state or Schengen country) must request to SEF - Serviço de Estrangeiros e Fronteiras (Immigration and Borders Service) a residence permit within 3 months after their arrival. All EU citizens are entitled to this permit, which is valid for one year and can be extended for equal periods. This request must be submitted to the SEF's Regional Delegation in the city of Braga (click here for address and contacts). Students from EU and EFTA countries are required to hold a European Health Insurance Card. This document should be requested to the social security service of the student's home country and allows citizens from any European Economic Area (EEA) country to be assisted in case of sickness or personal injury, thus taking advantage of a wider coverage in terms of health care. This card is proof of registration at their country's social security service and allows students to take advantage of health services in Portugal, and will be asked to pay for health care services as much as national citizens under the same circumstances. We are pleased to welcome international colleagues for purpose of teaching (STA) usually for up to one week, requiring a minimum of 8 hours of teaching. 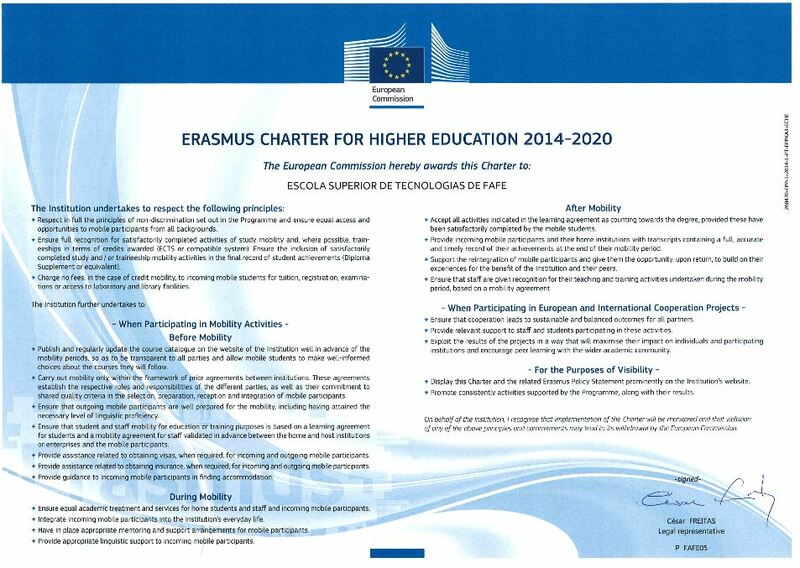 The existence of the Erasmus+ inter-institutional agreement is a must. The member of staff and the relevant academic department at ESEF or ESTF must mutually agree on a teaching programme before the visit takes place. The member of staff can arrange this directly with the Erasmus+ Departmental Coordinator in the respective academic department. Please check the list of the Erasmus+ Departmental Coordinators. We welcome colleagues for training visits (STT) usually for up to one week for purposes of job shadowing, observation, transfer of knowledge and good practice, learning from shared experience, acquiring practical skills and discovering new ideas for teaching and learning. No Erasmus+ inter-institutional agreement needs to be in place.